The bald eagle, haliaeetus leucocephalus, our nation’s most recognized symbol is considered by many to be the living embodiment of the core values of our country, strength, freedom, pride and nobility. These large birds of prey are incredibly common in Seward and are often seen soaring about majestically as they do, fighting with ravens for fish scraps outside of the fishery or bullying the seagulls into submission near the docks. A few days ago I had the pleasure of watching the bald eagle’s mating ritual. 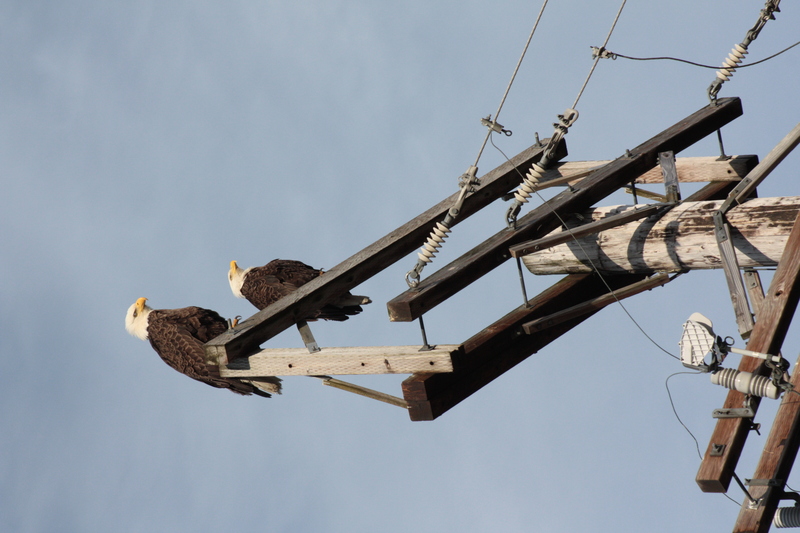 It starts with loud chirping screams as one eagle circles and approaches the other eagle (perched on a power line). The eagle lands and they begin to elaborately call to one another, sometimes it sounds like a car alarm at other times a furious banshee. They ruffle their tail feathers, stretch their wings, inch in close to one another and stumble back away again, flirting like shy middle school kids at their first dance. Suddenly, one eagle flies off, up and up in a spiral and out of sight. The other follows, shrieking and pursuing. They soar around, swooping towards and away from each other, slowly the distance between them closes. Then, it appears that they stop in mid-air, their wings outstretched, their talons aimed at one another. Suddenly, they embrace, entangle, lock talons and tumble in a chaotic cartwheeling heap towards the ground. (In this case landing with a loud thunk as they crash to earth). Then the dance is over, they fly off in opposite directions, silent and soaring. 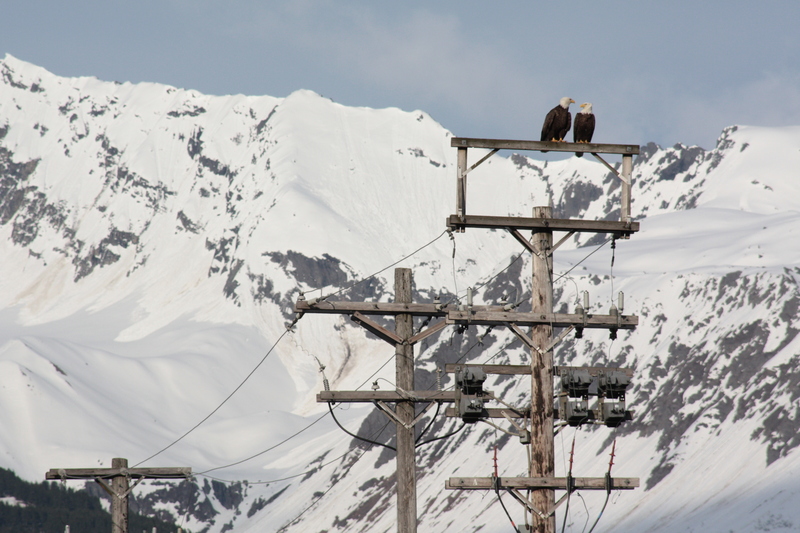 This entry was posted in Alaska, Wildlife and tagged Alaska, bald eagles, mating. Bookmark the permalink. I WANTED TO SEE A PICTURE OF THEM ENTANGLED AND TUMBLING TO THE GROUND 😦 WHASSA MATTA WIT CHEW?? LOL. LOVE AND KISSES.